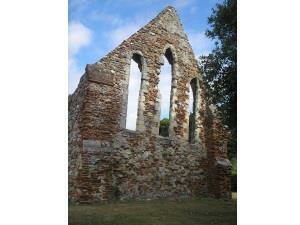 Situated in an unexpected oasis of tranquillity on Spital Road is one of Maldon's best kept archaeological secrets. The chapel was founded to provide services to the lepers and became a general hospital for the poor and infirm. It was connected to Beeleigh Priory and, following the dissolution of the monasteries, served as a farm building for many centuries until work commenced to restore the ruins in the 1920s. The remains of St Giles represent the town's only standing Scheduled Ancient Monument: most of the existing structure dates from the 12th Century and contains Roman bricks. This peaceful enclave is the perfect spot to while away a contemplative hour. Grassed area around ruins. No marked paths. No facilities. By prior arrangement with Town Council. On Spital Road, Maldon. Parking in nearby side streets.